With The Gods Are Crazy, Craig McCullen offers viewers both colorful stained glass works and large drawings, highlighting his abilities across media while also shedding light on the similarities in his approach to both. "The drawings have the feel of stained glass windows with puzzles of shapes contained in a format," McCullen explains. "Just as with a stained glass puzzle, each shape in the drawing is vital to the composition. The background is as important as figure. But unlike stained glass where every shape is defined by a black line, these drawings often leave open areas where there are no visible boundaries between the background and the figure. The viewer’s imagination defines the boundaries to give the drawing order." 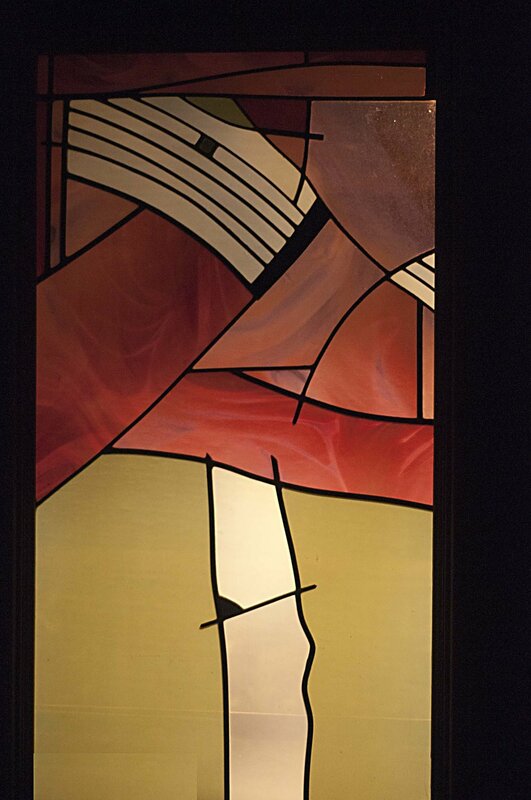 Primarily known as a stained glass artist, McCullen creates work that is both imaginative and whimsical. He owns Whoojoo Glass Studio and Art Gallery in downtown Lafayette, Louisiana. He has completed works for New Iberia Catholic High School and Our Mother of Mercy Catholic Church in Rayne, Louisiana. He has had opportunities to work and study with leading glass artist in from around the world in addition to having taught at the University of Louisiana at Lafayette and with the Acadiana Arts Council. He has been an artist member at BRG since 1987. This exhibition is presented alongside the latest works from Brian Kelly, Steve Schmidt, and Van Wade-Day. All works from these four artists are on view, free of charge, during normal gallery hours (12 - 6 p.m., Tue - Sun) through June 28, 2018.